One of the nice features of the RoccaForte is its number of areas that allow for placement of multiple items that flight simmers love. Many people are multi-monitor types and the RoccaForte certainly will appeal to those folks trying to find a desk that can handle two or three monitors in series. 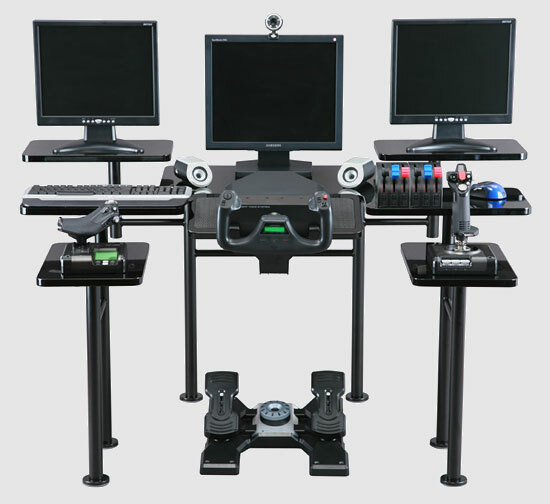 Others, like me, have one monitor but several pieces of flight simulation hardware that they have picked up over the years. The desk is quite capable of accommodating those folks too. In the past I kept my computer on a fairly large older roll top desk that was designed to accommodate a 17 inch monitor. Back when I got it I thought it would be the end all, be all and I would never need anything else again (who hasn’t said that?) but over the years monitors have gotten bigger, extra junk has been bought and in reality my desk looked more like a pile of junk with a monitor in front of it rather than a nice neat desk. Well, I now have room to stick my little GoFlite button tower, my QuickShot (just need to program the thing), my CH flight gear and such. The RoccaForte is very good at putting all this stuff at your fingertips. 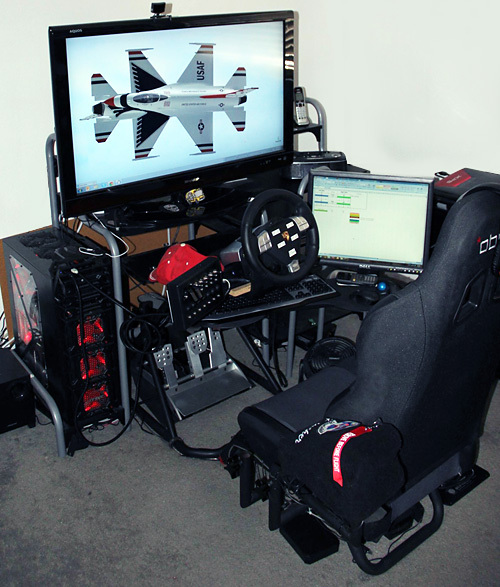 I really do like the way the desk is setup to allow gamers the ability to flick a switch wherever it is needed. 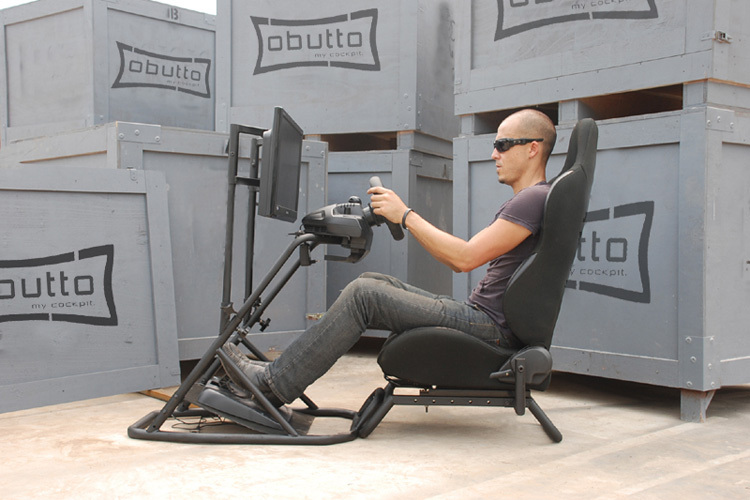 Ergonomically just about everything is close enough for the average sized male’s reach. Shorter folks may have trouble reaching items on the back shelf but that is the worst of it. The keyboard holder is adjustable, both up and down and at an angle. This is a very nice feature for computers that have multiple people using them. Adjusting the height of the keyboard allows for different people to use that keyboard in comfort and should cut down on wrist damage associated with keyboard use. 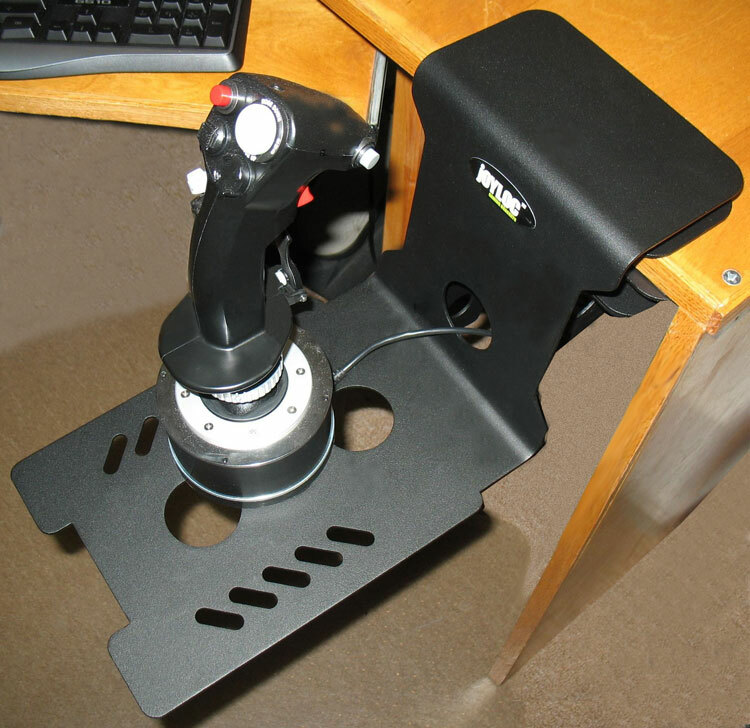 This is also nice if you are a driving fiend and want to mount your wheel in place of your keyboard in that spot. 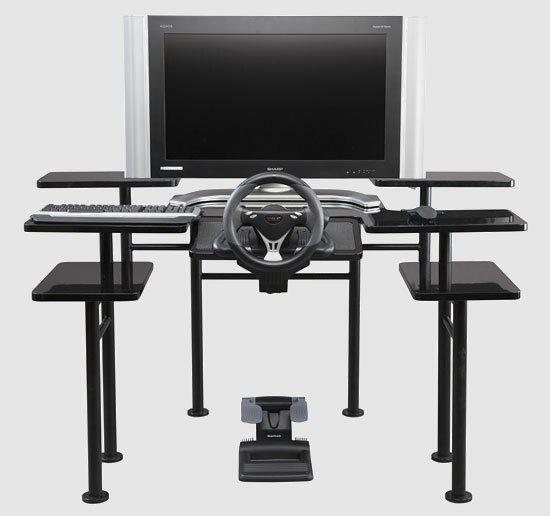 You can adjust the angle and height of the wheel to your comfort and even slide the entire keyboard rack back in want. The keyboard holder could be better designed to hold odd shaped keyboards but it seems to keep mine in place without too much difficulty. I do have a couple of problems with the desk. My major complaint with the RoccaForte is related to the storage ability that the desk has. Or should I say the lack of it. One thing my old roll top has over the RoccaForte is drawers. The RoccaForte has none which means that any odd things like printer paper, CD jewel cases, miscellaneous paperwork or software and such will have to be stored somewhere else. In the past my roll top did the job of being a platform as well as a storage area but since the RoccaForte operates as just a platform you will have to adjust and either keep a smaller desk or some kind of bookcase available to store the stuff you normally would put in your desk. For some folks this isn’t a problem but those with limited space might have a problem putting both the desk and a storage system together without taking up a good part of the den. The other problem I have with the desk is its size. The desk is 56 inches wide, which is really not that wide. A good sized desk is about that long and the desk that the RoccaForte replaced was only two inches narrower. The problem is that the desk is almost 41 inches deep, and it can stick pretty far out into some people’s rooms. This was a major concern with my wife, something that I can appreciate. This is an imposing piece of furniture and if you do decide to buy it you had better consider how it will make a presence in your room. My last concern is something minor but if you are a pig you might want to consider it. The desk is jet black and very shiny. It is a very pretty desk and I was surprised when my wife (who hates just about anything modern) commented that it looks actually quite nice. Unfortunately, as anyone who has owned a black car can attest, it can and does tend to attract dust. 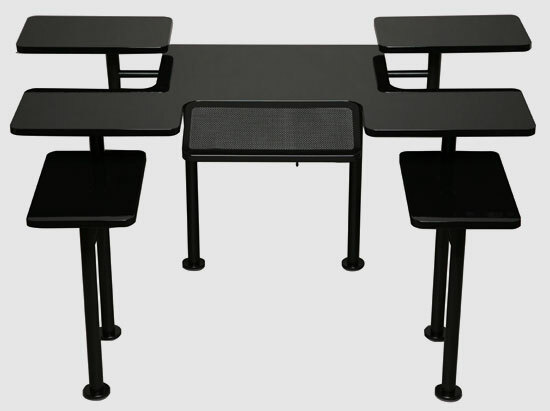 Well, probably not more than any other desk but since it is jet black anything on the desk will show. Fingerprints smear it easily. I find myself spending a lot of my time wiping my fingerprints off of the desk after use. Who knows, maybe it will break me of my piggish ways.